SpayNeuterOhio is an all-volunteer 501(c)3 tax-exempt organization whose mission is to reduce the number of free-roaming stray animals and animals euthanized in shelters by providing low-cost spay/neuter access in Stark County, Harrison County, Jefferson County and eventually throughout Ohio via the RASCAL low-cost mobile surgical unit and other means. THIS CLINIC IS NOT A MONEY MAKING VENTURE. SpayNeuterOhio hosts the RASCAL Unit, (www.rascalunit.com) a mobile low/cost spay/neuter clinic, at various locations throughout the year. ALL APPOINTMENT SCHEDULING WILL BE HANDLED VIA E-MAIL OR THE ONLINE SCHEDULING REQUEST TAB. PLEASE DO NOT CALL TO MAKE AN APPOINTMENT. When you request an appointment online, you will be directed to PayPal to make a $20 deposit via PayPal or debit/credit card. HARRISON COUNTY RESIDENTS: AlterClinic Animal Care in Canton is providing transport from Cadiz to their low-cost clinic twice a month beginning January 2nd, 2019. Call 234-804-3064 for details and to make an appointment. Visit their website at www.altercareac.com for pricing and operation. Note: AlterClinic’s pricing and operation are different from SpayNeuterOhio’s pricing! Please contact them directly for details. Appointments are required and will be accepted roughly 6 weeks prior to the clinic date on a first-come, first-served basis. Appointments may be made by requesting an appointment online or by calling the number below for the location you are requesting. There are a limited number of spots. Deposits not received to hold the spot may result in the forfeiture of the appointment; we will try to notify you. The clinics MUST operate at full capacity in order to continue offering them. No-shows will not have their deposits returned. Please be aware that the clinic schedulers are VOLUNTEERS who work full-time jobs and have commitments in addition to hosting these clinics. Please be patient in awaiting a return phone call and be aware that online registration is the best way to contact us. If you’d like to make a donation of clean, gently used blankets and/or towels, the dogs and cats would really appreciate it! We do very much appreciate your donations to support our charitable work. 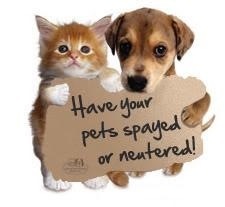 Spay Neuter Ohio provides access to low cost spay and neuter surgeries and other basic veterinary care for communities throughout northeast Ohio and eastern areas of Ohio. Without such programs, countless cats and dogs will be born into a world where there are already too few good homes. Donated funds are used to support these important programs; therefore, we are unable to refund donated amounts. Any items purchased online from Spay Neuter Ohio, or items purchased from Spay Neuter Ohio at fundraising activities or other events, are sold on an AS IS basis, without any representations or implied or express warranties of any nature whatsoever. As a result, Spay Neuter Ohio will not accept returns of purchased items and cannot issue refunds for such purchases. Help support Spay and Neuter efforts throughout Ohio. Order one of the Pets Ohio Pet Plates at the Ohio Deputy Registrar’s office. For more information, click on the plate below!